The SEBO automatic X-series vacuum cleaner is the most technically advanced upright vacuum cleaner in the world. It's ability to monitor the resistance of the brushroller against the floor allows it to raise or lower the powerhead automatically to the proper cleaning height. This guarantees optimal cleaning performance on all types of carpet and flooring and protects the floor from damage. The Intelligent Design of the SEBO automatic X ensures that the cleaning of hard floors (as well as carpets) is highly effective. The sealing strip on the bottom of the machine stops the kickback of dirt and channels the airflow through the remaining three sides, increasing the cleaning performance. The Electronic Control is the brain of the SEBO automatic X vacuums. Not only does it control the automatic height adjustment, it is equipped with warning systems and automatic shut-off capabilities that are designed to alert the user to machine problems such as clogs, full bag, and brush obstructions. First, the three-layer full-size filter bag collects the vast majority of the debris. Then, any remaining particles are collected by the hospital-grade micro-hygiene filter. Finally, the micro-exhaust filter cleans the exhaust air that the vacuum emits. The S-Class filtration system as described above, results in 99.9% effectiveness to 0.3 microns making the SEBO automatic X-Series vacuums the perfect choice for consumers who suffer from allergies and asthma. LIFETIME BELT WARRANTY. The reinforced toothed belt on the SEBO automatic X-Series vacuums will not slip or stretch resulting in a more efficient use of power and should last the life of the machine. Changing the filter bag is simple and clean - when the bag is sealed, no dust can escape. Removal and maintenance of the brushroller requires no tools! The entire machine is user friendly and can be disassembled in minutes (no tools are necessary). Finding and clearing blockages has never been easier. Includes a 1495AM stretch hose and a 6179ER turbo brush. Made in Germany, the AUTOMATIC X series are the best commercial-grade, upright vacuum cleaners in the world because they are technically advanced and uniquely easy to use! They have truly automatic height adjustment, to ensure optimum performance on carpets and hard-floor surfaces along with superb pet hair removal. Both models feature an electronic controller that acts as a brain, measuring the resistance of the spinning brush roller against the floor and adjusting the power head up or down to the appropriate cleaning height. The sealing strip located behind the brush roller further improves hard floor cleaning performance, by channeling the airflow and preventing debris kickback. Users are alerted to a worn brush, and the vacuum shuts off automatically when a full bag, a clog, or a brush roller obstruction occurs, which protects the motor, belts and carpets from damage. The AUTOMATIC X4 is powerful, yet quiet, and will provide years of reliable use! It also has a convenient instant-use cleaning wand and suction hose with an eight-foot reach, three on-board tools, a lifetime belt warranty, plus a five-year warranty on other parts and labor. Additional features include excellent filtration, a giant 1.4-gallon bag, an extra long 40-foot cord, rubber-coated wheels to protect floor surfaces, a low 5.5-inch horizontal cleaning profile that fits under beds and furniture, and tool-free brush roller removal for replacement or bristle cleaning. I have to say that any Sebo product I looked at is a superior piece of equipment. I settled on the X4 and do not regret it a bit ! It is fantastic ! The automatic height adjustment takes any guesswork out of properly adjusting the height for any cleaning surface. Never having to change another belt ever again is also great feature. Even if I did manage to break a belt , it carries a lifetime belt warranty ! How cool is that ! I doubt I can ever break a belt though, I tried ! after I got it home I purposely picked up a towel and this vacuum actually shuts itself off !! Actually the dealer showed me how it shuts itself off in the shop but I wanted to try it myself :) I would suggest visiting a vacuum cleaner shop. They are the professionals . I invested thousands in my flooring of my home , I wanted a quality piece of equipment to take care of that flooring . A vacuum dealer will steer you in the right direction. Sebo is a great product ! We were considering a Dyson, but after talking with the owner of a local vacuum-only shop we decided to go with the Sebo. We have two indoor Labrador Retrievers who shed a lot, and we also have no grass in our backyard, so we needed something that would be powerful enough to pick up all the dirt and dog hair We were so impressed with the Sebo's ability to get the job done. We only had to use one pass on the dirtiest and hairiest areas of our carpet, and the Sebo made it look like new! 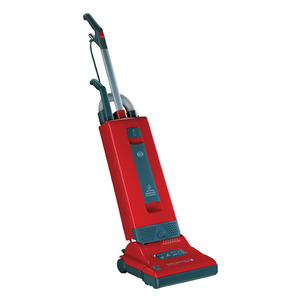 The vacuum is not very loud, is relatively light, and the attachments are easy to use. It automatically shuts off if something gets caught in the brush, and is easy to disassemble to remove a clog or other problem.